Dedicated Freight Corridor Corporation of India Ltd. is a Special Purpose Vehicle set up under the administrative control of Ministry of Railways to undertake planning & development, mobilization of financial resources and construction, maintenance and operation of the Dedicated Freight Corridors. DFCCIL as incorporated in October 2006 under the Indian Companies Act 1956. 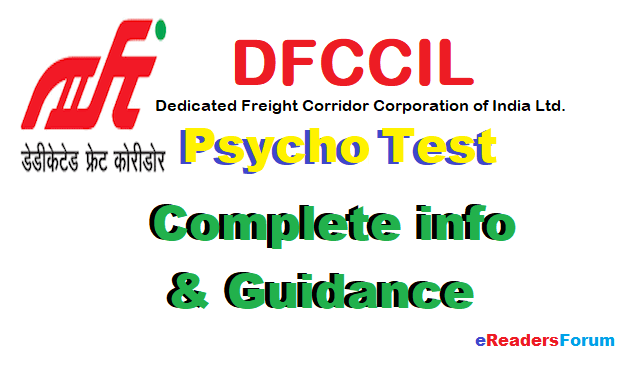 The Psychometric Tests to be conducted by RDSO (Research Designs & Standards Organization), Lucknow. Psychological Aptitude Test is a scientific way to measure the Mental Capabilities of an individual. It is also called as Psychological Aptitude test. The candidates are required to qualify in each and every test individually, scoring the minimum cut off, which is different for the different tests. The cut off for these tests are decided on the basis of extensive norming exercise. You can read the minute details of each psycho test here. Just follow the below link. For Each Test, follow the below links to learn Tricks.